Want a constant supply of juicy tomatoes to hand? Here's how to get started growing them yourself. The tang of sweet flesh and pop of warm seeds when you eat a homegrown tomato plucked straight from your own vines is incomparable. 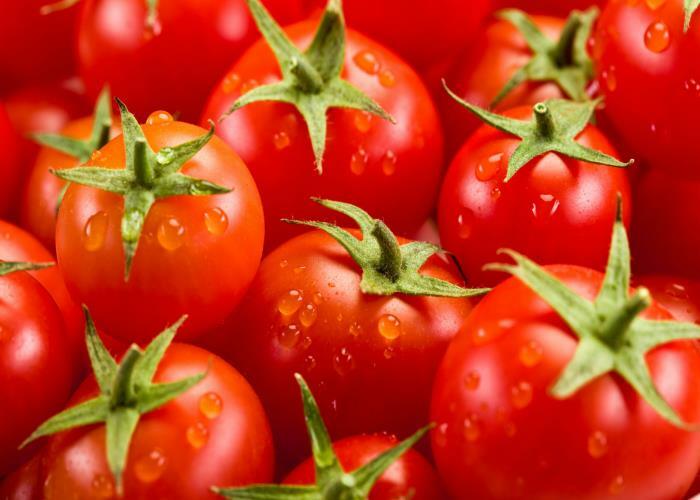 Grow your own tomatoes have welly-boots of flavour that leave artificially-ripened supermarket tomatoes quivering under their cellophane. And growing them is child’s play. First, decide on your variety. There are 10,000 types grown globally – from tiny cherries to pears, plums and bulbous beefsteaks, and from yellow and tangerine orange to bruised purple and striped. The key is to consider how you like to eat them. Straight off the vine? Go for a sweet cherry type such as Gardener’s Delight. Squished into a sauce? Try bittersweet San Marzano. Stuffed or baked? Go for a beefy Yellow Stuffer. And consider your space. Cordon tomatoes (those grown from a central stem that needs staking) are great for greenhouses, but for patios a dwarf variety such as F1 Sweet ‘n’ Neat will flourish in a pot, and a tumbler (i.e Tumbling Tom) will blossom in a basket. Next, get going early: the end of February or beginning of March is best. All tomatoes, whether destined for a greenhouse or garden, need to be sown indoors first because they require a long growing season. And, of course, a late winter frost will finish them off. Start the seeds off by sowing two or three into individual modules in a seed tray, filled with moist, peat-free compost. Place the seed on top and cover with 1-2cm soil and pop on a watering tray so you can water at the base (overhead watering can slosh the seed away). They need a nice warm spot (at least 18C) to germinate and grow, so position in a heated greenhouse or on a bright windowsill. Or if you have cash to splash, consider a propagator, which will maintain constant heat and humidity levels. That said, plastic bags work well for me, wrapped around the tray or pot and secured with an elastic band. Once two ‘true leaves’ unfurl (these are the small, serrated adult leaves, not the oval ‘seed leaves’), it’s time to give your seedling a bigger home, or ‘pot up’. To do this, fill a 3cm pot with soil and make a hole in the centre using a dibber, ease your seedling out of its current pot with the end of your dibber (I like to use a sharp pencil), and holding the seed leaves (not the stem) drop it into its new home. You may need to pot up more than once before planting out. When the stem reaches pencil thickness and has four true leaves, ‘harden off’ your seedling, i.e. get it used to the great outdoors, by putting it outside in the day and bringing it in at night for around two weeks or until all threat of frost has past (this is especially important if you plan to plant outside). It might sound laborious, but your tomatoes won’t grow in anything less than 12°C temperatures day and night, so there’s no point in rushing. Once they’re fully-fledged, plant into deep grow bags in the greenhouse, into ‘long toms’ or containers outdoors (cordons will need to be tied into canes) or into hanging baskets. Plant them so that the seed leaves are flush with the soil or deeper: they like it snug, and sink cut-off plastic bottles into pots or greenhouse beds so you get straight to the root of the matter when watering. Feed container tomatoes three or four times over the growing season with a tomato fertiliser. Cordon tomatoes will need ‘pinching out’ too – this is when you remove the side shoots between the main stem and the branches to focus the plants energy into fruiting rather than getting gangly. It’s best to use scissors or secateurs (rather than the conventional finger and thumb) as a sharp cut is less likely to harbour disease. If it’s altogether too much faff, choose a bush type such as F1 Lizzano that doesn’t need pinching. So, given a bit of TLC, you should be picking tomatoes right into October. Here are some top tips from gardening experts. Do you have any top tips for growing your own tomatoes? Pleases hare them in the Comments section below.